Well Mike Nicholas is at it again. You don’t know Mike? He is the guy who spark plugs the Georgetown Colorado hill climb. 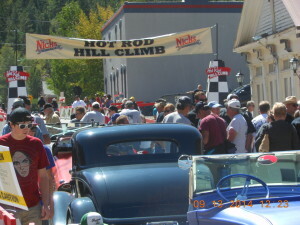 (http://hotrodhillclimb.com) For you flatlanders and out of town folks and out of the country folks but hopefully on this earth folks, Georgetown is an old mining town just below the Continental Divide on I70 out of Denver. Going out of Georgetown there is a steep road called Guanella Pass that runs up the side of the mountain. Back in the early fifties a race was run up that pass featuring the hotrods of the era. The cars are still around in Denver and other places. On September 12th and 13th 2014 they gathered for the second time in two years and ran up the pass. Mike tells me h e even cars came in from the East and out of Californial. Hot Rod magazine did a great spread on last year’s race and interest is building high for this year. Now of course they cannot race like the old days so it is called an “exhibition run”. I ask you, take an old racer put him in a full race flathead tuned for the altitude and tell him: “The road is clear and to just take it easy”. What I would say over the bull horn: “Mothers get your children off the street or it could get messy”. The only way they will take it easy is if they get a cramp in their gas pedal foot or the fan blade goes through the radiator. Needless to say these are my kind of guys and I was up th ere and set up a book stand and pitched my book. 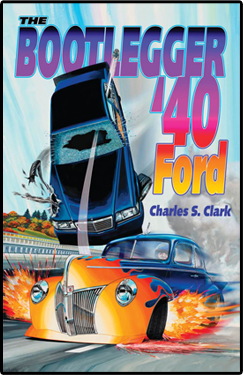 (charlesclarkauthor.com). Unfortunately I was not eligible to take the 40 Ford Bahnburner up the hill. It is a cheater car because it has electronic fuel injection on a 347 OHV engine. 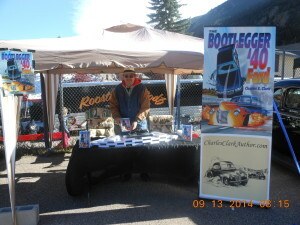 Let me ask you: what would hot rodding be without a little cheating? So I ran it up after the meet was over and it really flew.Try and make it next year if you can. Bring asprin for altitude headaches and earplugs for open header exhausts. See you there.